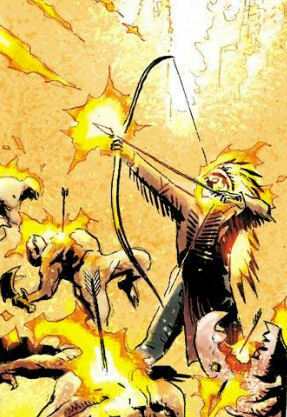 Powers/Abilities: The "Plains Indian Ghost Rider" wielded a bow (presumably a Lakota bow) which fired burning arrows. These could penetrate all the way through a human target, and he could fire them with great rapidity. His horse, unlike some Ghost Riders steeds, was not skeletal, but did discharge fire from its mouth and eyes, and had hooves lined with flame. Like most of the Ghost Riders, the "Plains Indian Ghost Rider" presumably possessed superhuman strength and durability. History: (Ghost Rider VI#33 (fb)) - The Plains Indian Ghost Rider hunted down and slew trappers who had turned scalphunter, callously murdering old women and young children for their bounty. He found one group sitting round a camp fire in the Dakota snow, laughing and joking about how much money they were going to make from their victims' scalps. He announced his presence by shooting one of the killers through the throat, then rode into their midst, uttered a war cry and nocked his bow to shoot another of the group. 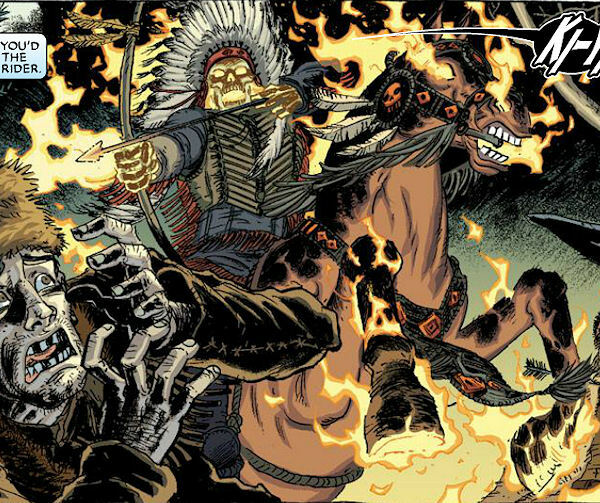 (Ghost Rider: Heaven's on Fire#6) - Like all past Ghost Riders, the "Plains Indian Ghost Rider" was revived to take part in defending Heaven from both the now-rogue Zadkiel and then Kid Blackheart's demon army. He fought alongside the Undead G-Man during part of the battle. Comments: Created by Jason Aaron and Tony Moore. Like all the other Ghost Riders depicted in the flashbacks in Ghost Rider VI#33, there is limited information given about this character, though he gets more of a backstory than others. 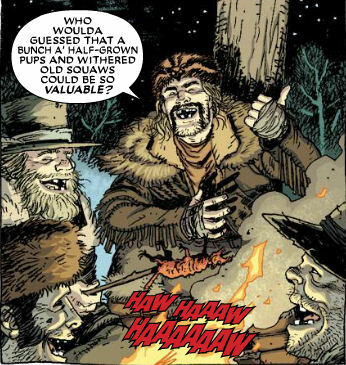 The text in the comic confirms him to be from South Dakota, and suggests he hails from shortly after the American Civil War, around the same time as Caleb, the Ghost Rider who starred in Ghost Rider: Trail of Tears. The script further identifies him as a "Plains Indian" and his era as the Indian Wars, and notes he should be wearing a Ghost Dance breastplate. A Lakota Ghost Dance breastplate is provided in the script as an image reference - thus, he is presumably Lakota. From my admittedly limited research (please feel free to correct me) the first Indian War that took place in South Dakota was the Great Sioux War of 1876-77, so that seems likely to be the conflict he was involved with - however, again from my limited research, the Ghost Dance movement apparently didn't start until 1890, which might suggest he was active around the time of the Wounded Knee Massacre in 1890, except that doesn't fit so well with being around the same time as Caleb, nor the scalphunters. From what I can tell, bounties were paid on scalps in the Dakota War of 1862, but that was during the Civil War and not actually in Dakota, so it doesn't fit either. So basically there's a bit of confusion as to exactly when he was active, though we can safely say it was mid to late 19th century. A group of five fur-trappers turned scalphunters operating in South Dakota during the Indian Wars murdered several Native American old women and young children for their scalps. That night, as they dried the scalps and gathered round a camp fire, the drunken killers laughed about how much money they would get in bounty, and joked about how unexpectedly valuable the "half-grown pups and withered old squaws" had turned out to be. The most vocal of their number was the first to die, as an arrow from the "Plains Indian Ghost Rider" pierced his throat. The others cowered in terror as the Spirit of Vengeance rode into their midst uttering a war cry and nocked his bow to fire again.